* Total Cost (cost per unit x program units) is provided to aid in program comparison only. All stated financial information is subject to change. This degree program prepares graduates to gain knowledge of business administration principles behind the functioning of a company or organization while developing a clear perception of business ethics based on Christian principles. In the daytime, residential program, the degree is offered with concentrations in accounting or management. 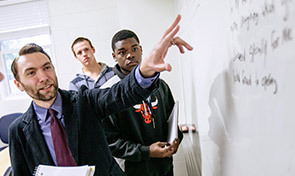 As a Business Administration major, you will learn how to use technology in decision-making, develop Christian servant leadership principles, solve problems using collaborative techniques, and learn how to celebrate diversity in business environments. You will become knowledgeable in the areas of accounting, business law, economics, finance, management, marketing, statistics and strategy. You might consider a Business Administration major if you seek a position in management or accounting for a business or organization, desire advancement within a company or organization with additional responsibilities and higher pay, or desire to learn more about management. This major is also helpful to those who wish to develop entrepreneurial skills necessary to start and operate their own business. Business Administration majors will become comfortable with analysis of financial information behind the operation of a business or organization. * Courses for the concentration are only available online. Concentrations available to those students under the 2012 Catalog or later. Course availability determined by established elective schedule. See elective course schedule here (PDF).